People close to me know that I ABSOLUTELY LOVE CRABS. I love them and I am very patient when it comes to de-shelling crabs (and most crustaceans). I make sure that I take out every meat that I can from these crustaceans. When everyone else doesn't want to get their hands dirty I am the exact opposite when it comes to crabs. I don't care if I'm in formal attire (let's say it a wedding reception with Chinese lauriat) I WILL NEVER TURN DOWN eating and de-shelling crabs. My Panget, well - he's really tamad to de-shell. He's very lucky that I LOVE to de-shell, well I don't mind to make himay for him. Honestly, I don't mind making himay for anyone (just make sure you feed me more crabs! Hahaha). So last Wednesday, I gamely joined Gerry and Donny. Secretly, I was very excited - I was telling my kids that I will be going to the mall to eat some crabs! And EAT I did! Hahaha! I'm so lucky that I don't have any allergies when it comes to seafood. Thank you, Lord!! 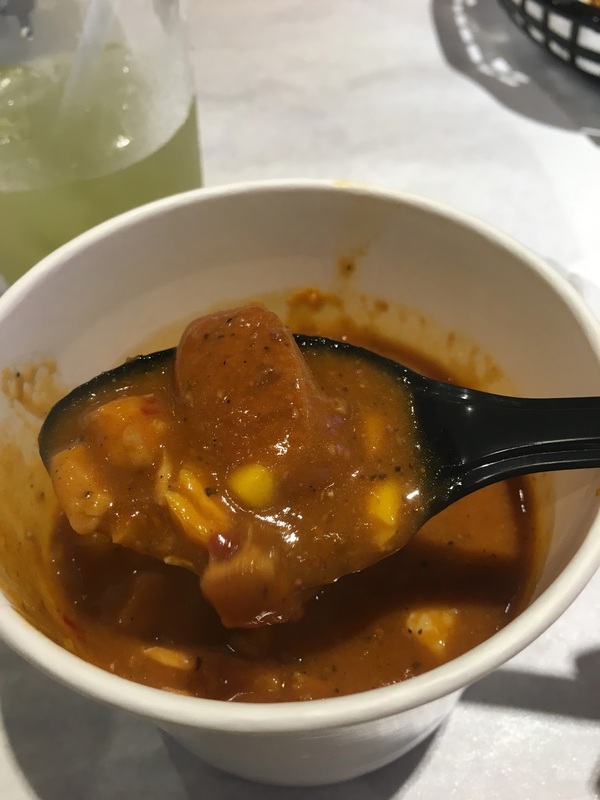 First up was the Seafood Gumbo. Honestly, I've only heard and seen Gumbo on TV. I've never actually tried it but it looks really interesting. When the crabs and shrimps arrived - I was ready. My tastebuds have *warmed up* and I was ready to take on the crabs. Bring it on! This is the crab boil. Look closely and you'll see the spices and the garlic. It's orange-y red and I was at first intimated, but then what the heck! I love crabs. They were serving drinks and I can just ask for water when my tastebuds can't take it anymore. So I dug in. I dug in like crazy. I was in the zone. I de-shelled, peeled, pulled, cracked every shell that was hindering my way into getting those crab meat. I didn't care anymore of the mess, I just did what I had to do (for the love of crab). The crab was HUGE. 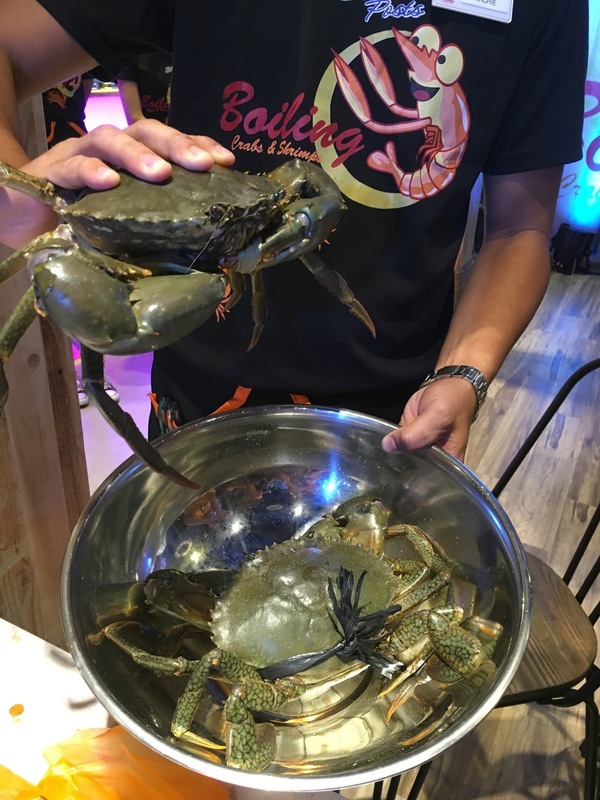 I have to say the biggest that I have had so far - and I have had MANY many crabs in my lifetime. The flavor was - wow. The spices, the garlic, the sweetness of the crabmeat, the combination was WONDERFUL. Honestly, I wanted more. Hahaha!! :) Seriously! Game OVER. Truly, this crab boil was game changing. 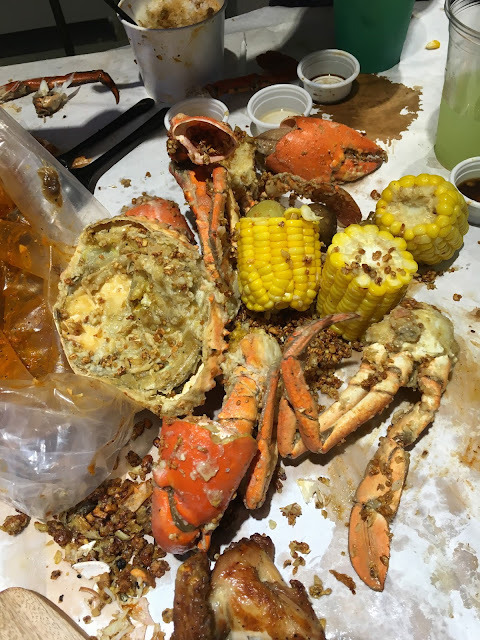 I was so used to eating the steamed crabs from chinese restaurants that I never thought I would enjoy a crab boil. I remember that a true test of a crab's flavor would come out with the simplest of method - steaming. But this Crab Boil just took it to another level - and I LOVED it. Here is a dear live crab before cooking. Look at the size! 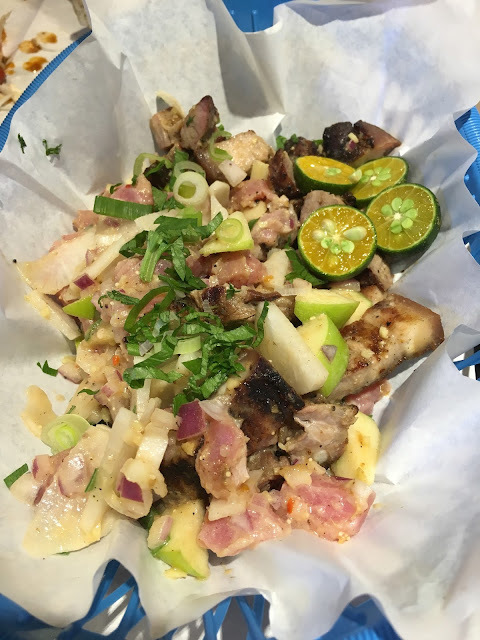 They also have Kinilaw with Liempo. Something I haven't seen combined ever. It's usually just kinilaw OR liempo, but this was both! Seafood and meat - I'm not complaining. Blue Posts Boling Crab & Shrimps had clams, mussels, squid and a whole lot of different seafood for you to try. These seafoods are flown in from Davao and are LIVE and fresh. They are only cooked upon order. So be rest assured that you are having FRESH seafood to consume. For their dessert - of course Davao pomelo! 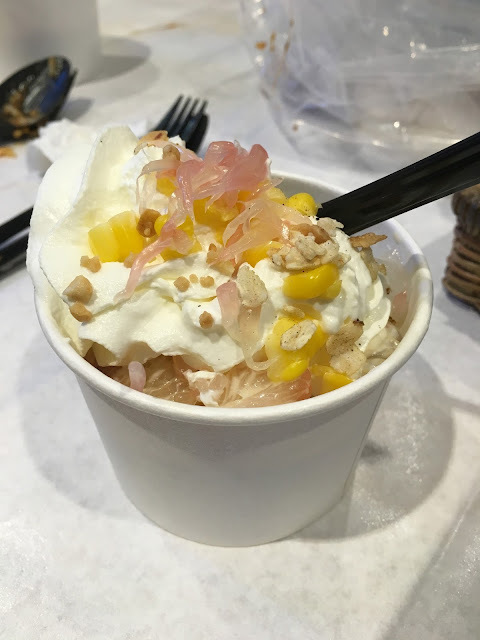 It's a Pomelo salad with cream, corn, nuts and shredded pomelo! It was a good way to end the meal filled with seafood eating. 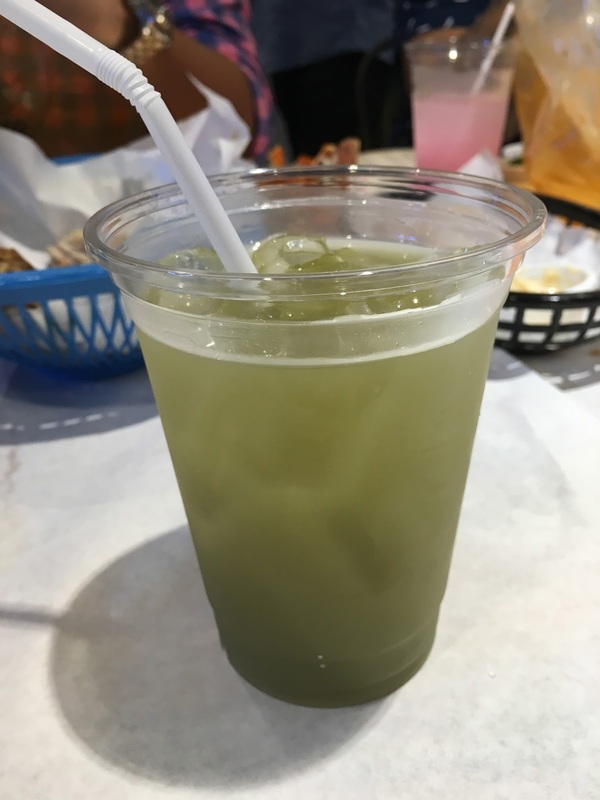 You can mix and match you drinks! You can drink them individually or just mix whatever you fancy! A friendly lady server told me that if I mix all the drinks together, it will come out to a black colored concoction. And so I told her I was game to try it and she mixed them all! But, it didn't come out black. Hahaha! But the taste was still good. I still liked it and even asked for seconds. 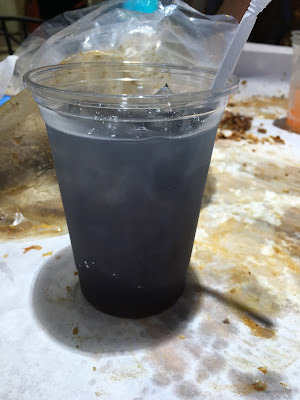 I was envious of Karl though, because his drink turned black! 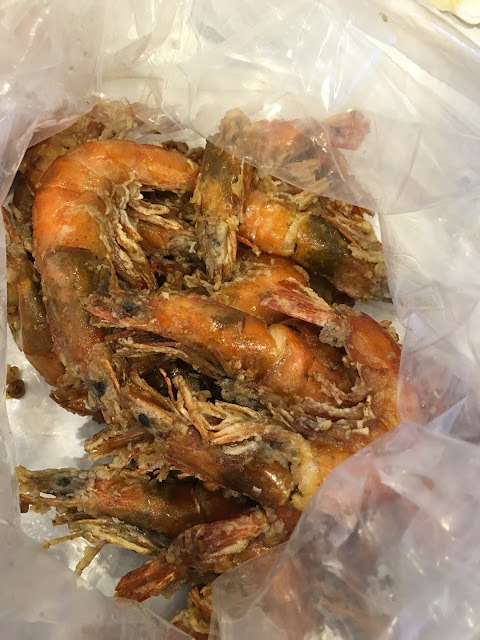 Blue Posts Boiling Crabs & Shrimps is opening tomorrow, August 26. Hurry on and try it! 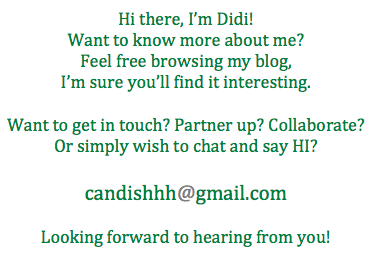 I promise you, you won't be disappointed! Make sure though to enjoy the meal with your hards. Getting down and dirty with seafood is the best. OMG, my kind of heaven. Haha! Sarap! Let's go when I come back, but I shall try this with the Bentomommas in Davao this weekend! Toy Kingdom's TOY EXPO 2016 this weekend! Manila! Manila! Starbucks Card Anniversary!